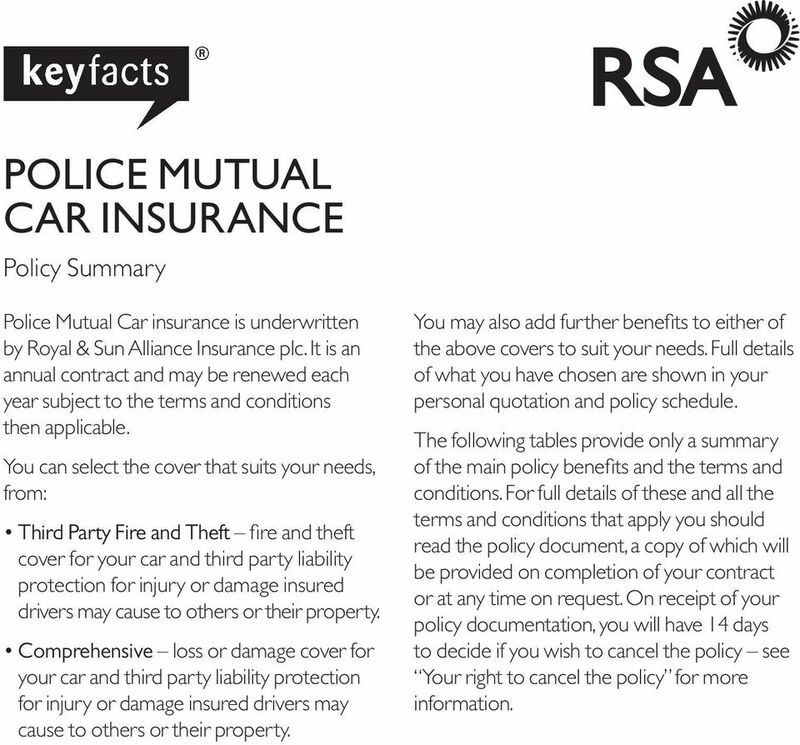 Download "Police Mutual Car insurance"
1 Police Mutual Car insurance Policy Summary Police Mutual Car insurance is underwritten by Royal & Sun Alliance Insurance plc. It is an annual contract and may be renewed each year subject to the terms and conditions then applicable. 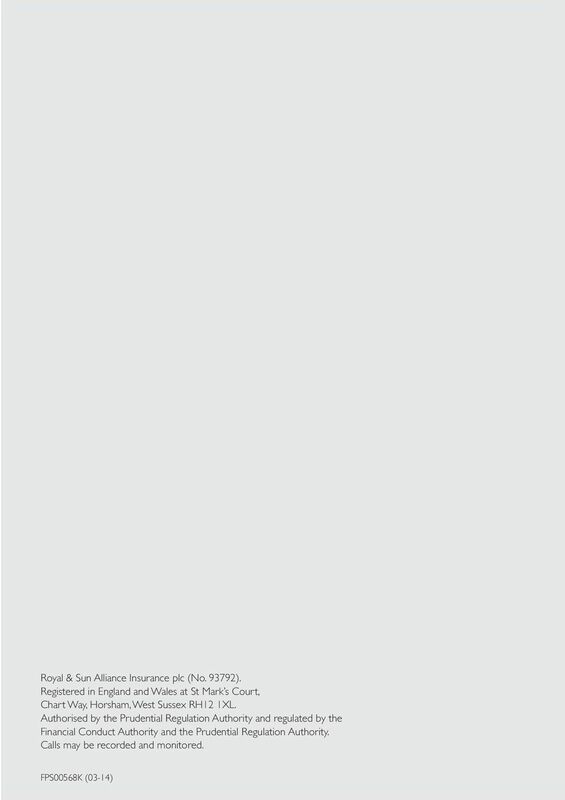 You can select the cover that suits your needs, from: Third Party Fire and Theft f ire and theft cover for your car and third party liability protection for injury or damage insured drivers may cause to others or their property. 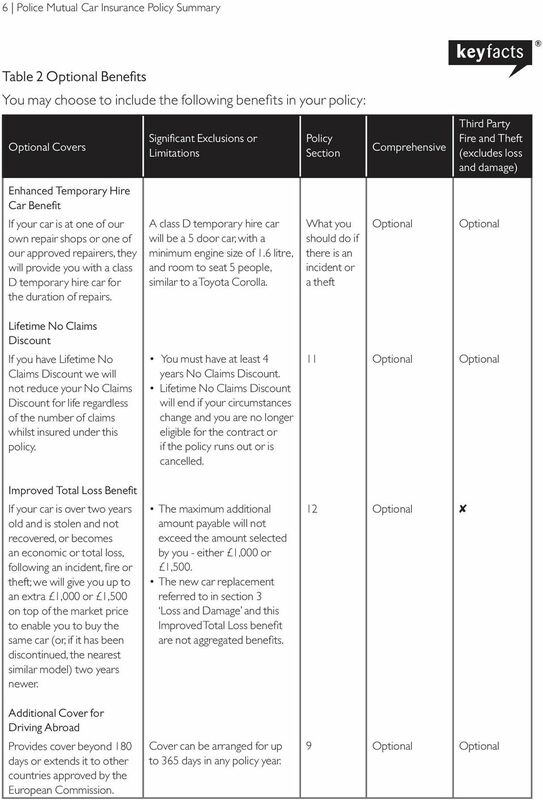 Comprehensive loss or damage cover for your car and third party liability protection for injury or damage insured drivers may cause to others or their property. You may also add further benef its to either of the above covers to suit your needs. 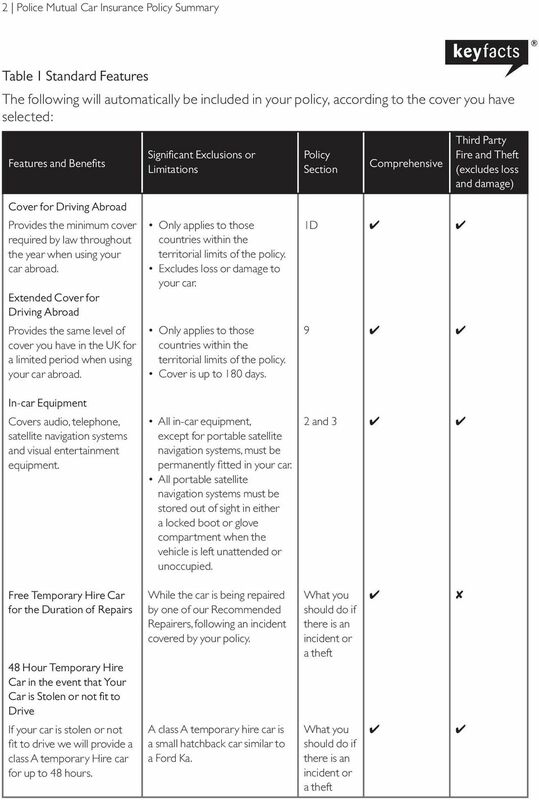 Full details of what you have chosen are shown in your personal quotation and policy schedule. 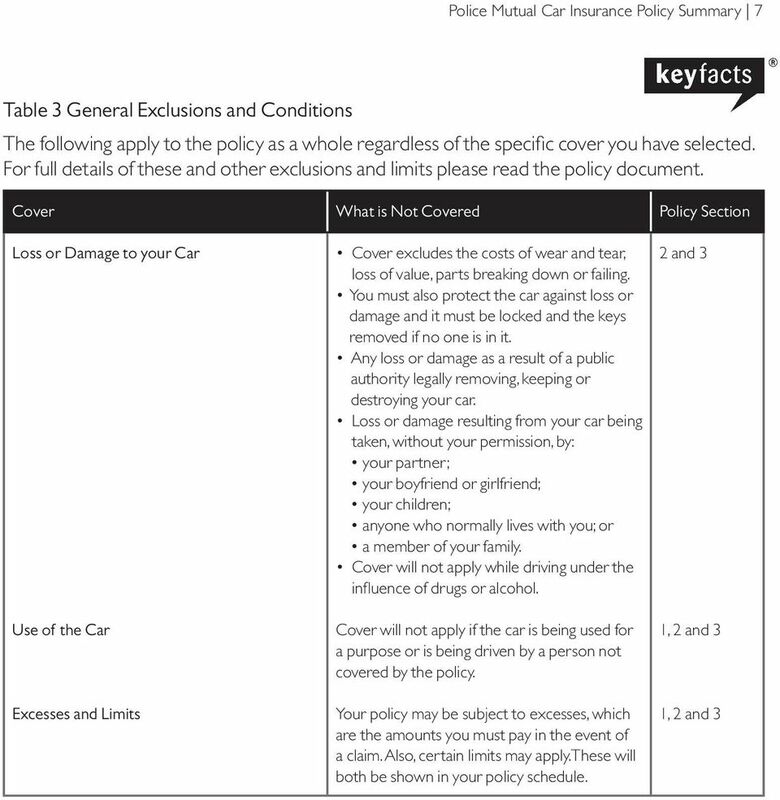 The following tables provide only a summary of the main policy benef its and the terms and conditions. 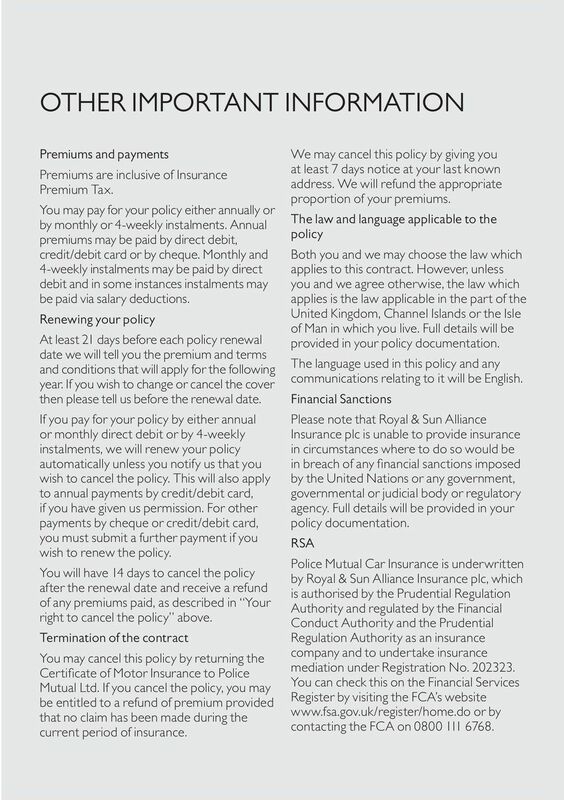 For full details of these and all the terms and conditions that apply you should read the policy document, a copy of which will be provided on completion of your contract or at any time on request. 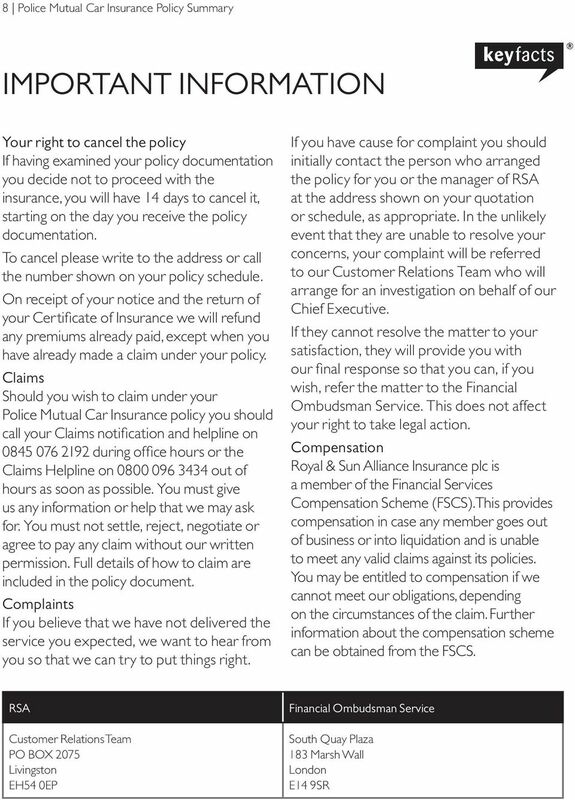 On receipt of your policy documentation, you will have 1 days to decide if you wish to cancel the policy see Your right to cancel the policy for more information. 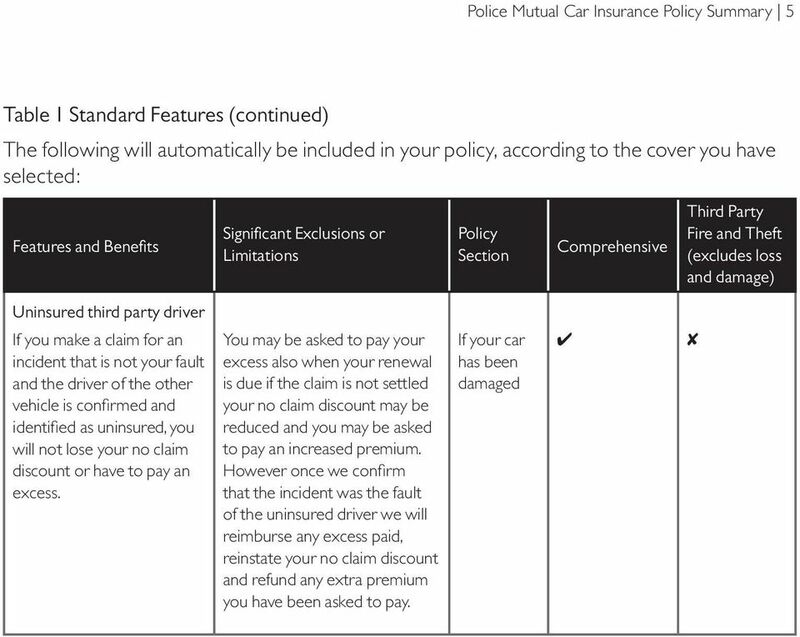 4 Police Mutual Car Insurance Policy Summary Table 1 Standard Features (continued) The following will automatically be included in your policy, according to the cover you have selected: Features and Benefits Significant Exclusions or Limitations Policy Section Comprehensive Third Party Fire and Theft (excludes loss and damage) Personal Accident Provides a lump sum of 10,000 if you or your partner were killed or suffer loss of sight or limb in, or while getting in or out of, any car. Anyone claiming who has a higher level of alcohol or drugs than is permitted by law. 5 Road Rage and Carjacking benefit The following benef its will be paid if you, your partner or any passengers in your car are injured as a direct result of a criminal assault following a road traff ic incident involving your car, provided the injury occurs within 3 months of the incident and results in: Death/Permanent total disablement - 5,000 Emergency dental treatment Hospital daily cash benefit - 20 per day for up to 15 days, but excluding the f irst two full 2 hour periods Death or injury caused by suicide or attempted suicide. 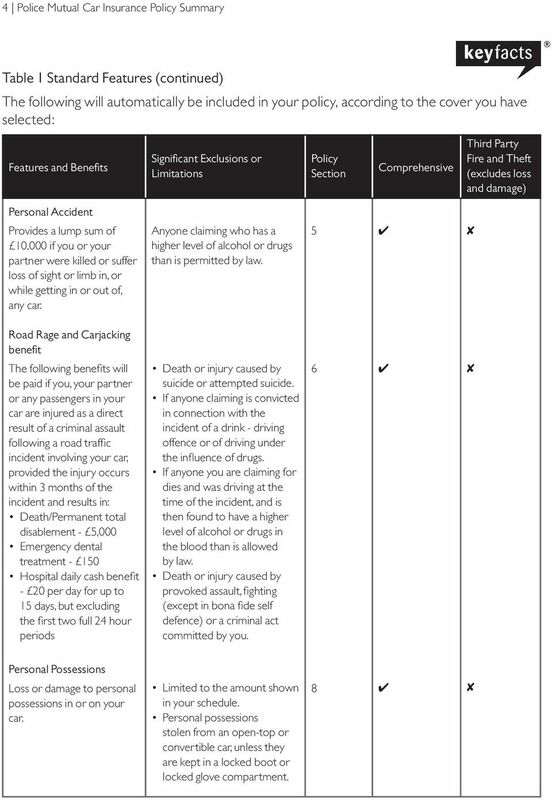 If anyone claiming is convicted in connection with the incident of a drink - driving offence or of driving under the influence of drugs. If anyone you are claiming for dies and was driving at the time of the incident, and is then found to have a higher level of alcohol or drugs in the blood than is allowed by law. Death or injury caused by provoked assault, f ighting (except in bona fide self defence) or a criminal act committed by you. 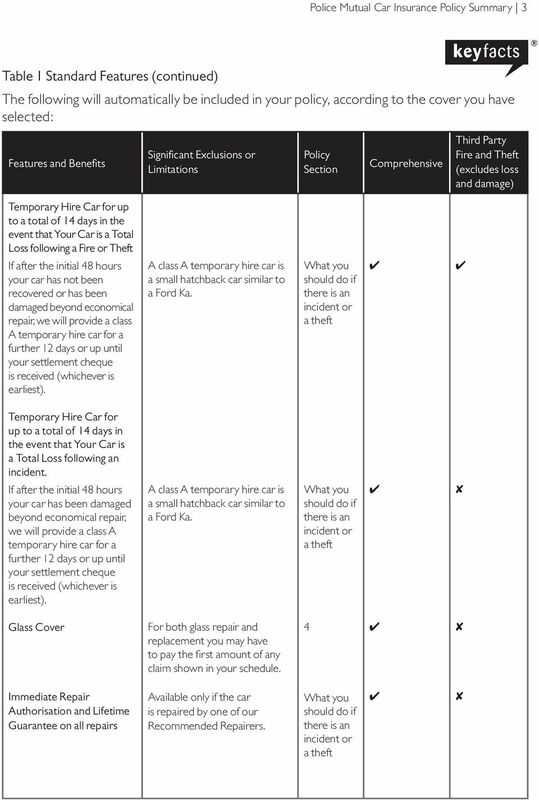 6 Personal Possessions Loss or damage to personal possessions in or on your car. Limited to the amount shown in your schedule. Personal possessions stolen from an open-top or convertible car, unless they are kept in a locked boot or locked glove compartment.